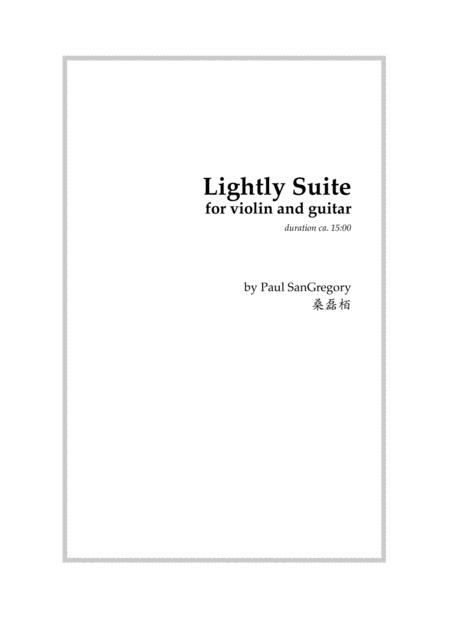 Composed by Paul SanGregory. 21st Century. Score, Set of Parts. 48 pages. Published by Distant Engraver Music (S0.365569). As the pun used for the title for this piece suggests, it is a suite of generally light movements that still possess a certain amount of depth. Though the harmonies are generally pleasant, seeming to have popular or jazz origins, there are various musical spices adding more body to that sweetness. The first movement, Improvisation, captures the mood of a free-form prelude, as if the players were improvising on a set of chords, some of which seem to be influenced by jazz or other non-classical idioms. Dialogue, the second movement, is a conversation between the violin and guitar. There are times when one instrument accompanies the other, but generally both players add important thoughts to the rhythmically diverse conversation. The third movement begins with a guitar accompaniment supporting the violin’s Song. Later, these two roles are reversed. Dance is essentially a disagreement. The violin plays a quasi-aristocratic eighteenth-century gavotte while the guitar prefers a sombre chromatic waltz. There is emphatic disagreement over which dance the players should perform, but in the end a solution seems to be found. The last movement, Pursuit, is a playful chase that is interrupted by a dreamy pause to catch one’s breath. Complete performance duration is ca. 15 minutes.